News archive containing information about Lambert Instruments products, events and workshops. The High-speed Intensified Camera Attachment (HiCATT) is an intensifier attachment that increases the light sensitivity of your high-speed camera. It is compatible with all popular high-speed cameras including the Photron and Phantom cameras. The HiCATT is now available with improved relay optics. This new optical design further improves the light sensitivity of the HiCATT for excellent high-speed imaging performance in low light situations. HiCATTs with 25 mm image intensifiers now include an improved optical design of the 1-to-1 (1:1) relay optics that offers light transmission improvements of up to 30%. In addition to the 1:1 relay optics, Lambert Instruments also offers 1.7:1 relay optics for optimal compatibility with smaller image sensors. 5 April 2017 - Groningen (NL) - Lambert Instruments today announced the introduction of its next-generation fluorescence lifetime imaging camera: Toggel. This new camera makes fluorescence lifetime imaging microscopy (FLIM) and fluorescence resonance energy transfer (FRET) faster and easier with its excellent light sensitivity, sharp images and fast image acquisition. "Toggel is the result of years of research and development." says Jasper Bosch, Development Engineer at Lambert Instruments. "From the start, we have collaborated with experts in FLIM and FRET at the Netherlands Cancer Institute, the University of Amsterdam and Delft University of Technology to make sure that this new camera fits the needs of our customers." "We used a prototype of this camera to develop a method for acquiring quantitative lifetime images from a single exposure." says professor Kees Jalink of the Netherlands Cancer Institute. "siFLIM takes advantage of the technical capabilities of this camera and simultaneously records two 180°-phase-shifted images. This allows for video-rate lifetime imaging with minimal phototoxicity and bleaching. siFLIM is also inherently immune to artifacts stemming from rapid cellular movements and signal transients." Toggel simplifies fluorescence lifetime imaging for researchers and imaging centers by combining excellent light sensitivity with easy image acquisition and data analysis. The new TRiCAM is available as of today. Our experienced sales engineers are happy to assist you with choosing the right image intensifier for your application. Please contact our sales team or one of our distributors for more information. Lambert Instruments is proud to announce the introduction of a new line of high-speed cameras: The Lambert HS Series. The first cameras in the Lambert HS series feature a fast high-resolution sensor. The Lambert HS540M and the Lambert HS540S offer simple and efficient high-speed imaging for scientific research, R&D, machine vision and other industrial applications. The Lambert HS540S is a streaming high-speed camera for industrial applications. It is designed for high-performance tasks like machine vision, quality control and wafer inspection. Instead of saving the images to internal storage, the camera streams high-speed video directly to your computer over a CoaXPress (CXP) interface. And with Power over CXP (PoCXP) the camera can be powered over the CoaXPress channels, removing the need for a dedicated power cable. Both the Lambert HS540M and the HS540S feature a high-speed CMOS sensor that records full-resolution images (1696 x 1710 pixels) at 540 fps. To increase the framerate, the camera can use a smaller part of the sensor to reduce the image resolution. By doing so, it can deliver framerates of up to 170000 frames per second. Its electronic global shutter and minimum exposure time of 2 us ensure sharp images of fast-moving objects. The Lambert HS540 cameras support digital imaging standards that make it easy to integrate into an automated setup. The Generic Interface for Cameras (GenICam) offers a universal programming interface for controlling the camera settings and retrieving the recorded data. Camera characteristics are determined using the measurement procedures from the EMVA 1288 Standard. This makes specifications more transparent and easier to compare to other cameras. Lambert Instruments is proud to introduce a new fluorescence lifetime imaging microscopy system: The Lambert Instruments FLIM Attachment for Time-Domain imaging. The LIFA-TD offers a turn-key solution for fluorescence lifetime imaging microscopy and is compatible with every widefield fluorescence microscope. From recording the data to calculating the fluorescence lifetime, the entire measurement procedure is automated by our advanced software. The LIFA-TD includes a camera with a built-in image intensifier, which can precisely control the exposure of the camera. With its advanced gating capabilities, the image intensifier can reduce the exposure time to 3 ns and alter the timing of the exposure in the subnanosecond range. A pulsed laser excites the fluorophores in the sample. By using a laser with a small pulse width, the accuracy of the lifetime measurements can be optimized. Images are recorded with our advanced software, which also processes the data to determine the fluorescence lifetime. The fluorescence lifetimes are then shown as a colorized overlay on the original image. Introducing a new control unit for intensifier attachments: The gain control unit for automated systems enables full control over the gain and anode current limit of the image intensifier. Communication over TTL and analog signals provides precise timing and ensures straightforward integration of an intensifier into your imaging system. And with its built-in protection features, the control unit helps to protect the image intensifier from overexposure. The gain control unit for automation systems is now available with our HiCATT and TRiCATT intensified camera attachments. 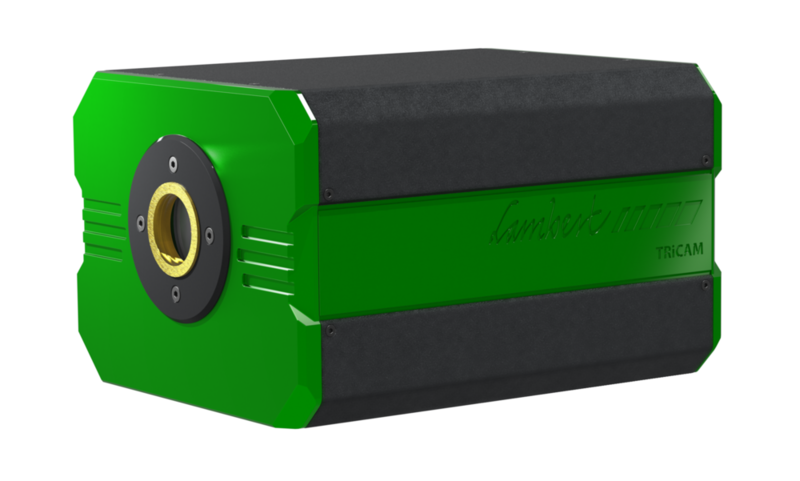 Introducing the HiCAM Fluo: A high-speed camera for fluorescence applications. It records high resolution images at a framerate of 540 fps in the most challenging lighting conditions. The HiCAM Fluo is able to capture the dim light of fluorescence by using a cooled image intensifier. Packed into a compact aluminum enclosure, it is easy to attach the HiCAM Fluo to any fluorescence microscope. With its 2.9 megapixel (1696 x 1710 pixels) sensor, the HiCAM Fluo can capture 540 frames per second at full resolution. It can achieve even higher framerates at reduced resolutions, up to 5000 fps at 480 x 480 pixels. An image intensifier boosts the intensity of the incoming light to ensure clear images of fluorescence light. The HiCAM Fluo can detect light intensities down to the single-photon level. The image intensifier of the HiCAM Fluo is cooled to minimize thermal noise. Our advanced cooling system provides a stable temperature for optimal imaging performance. All images are streamed directly to your computer over a high-speed interface, so the total recording time is only limited by the amount of available hard disk space. The official launch of the HiCAM Fluo will be at the Laser World of Photonics in Bangalore, India on September 23. Lambert Instruments and our distributor Dynotech Instruments will be at booth B006. For detailed technical specifications of the HiCAM Fluo, please visit our HiCAM Fluo page. Hereby we release the TRiCATT (Time Resolved intensified Camera ATTachment) intensifier. It is in line with the release of the TRiCAM, the intensified CCD camera for scientific applications. The TRiCATT M is the modulated intensifier component for frequency domain FLIM, and is the successor of the II18MD and II18MDS. The TRiCATT G is the gated intensifier for time domain and represents the successor of the II18 G(D)(F). Like the TRiCAM, the TRiCATT can be offered for scientific applications that require 1) low-light level imaging, 2) ultra-short exposures through fast gating, and/or 3) frequency domain imaging using lock-in detection. There are three models, the TRiCATT M for frequency domain FLIM, the TRiCATT G for time domain (gated mode) and the TRiCATT GM for both frequency and time domain imaging. For a detailed specification of the features and applications of this versatile product please see here. Lambert Instruments has introduced a streaming version of its HiCAM 500 intensified high-speed CMOS camera that includes a full Camera Link® interface, making it possible to directly stream 500 fps (full frame) to your computer. The streaming HiCAM can be used in a smart camera setup by combining it with an FPGA enabled framegrabber. The first streaming HiCAM was delivered to Zarm, the center for applied space technology and microgravity of the University of Bremen in Germany. At Zarm the HiCAM is used for a combustion experiment under microgravity conditions. The experiment is prepared in the Zarm drop tower and finally performed as part of an ESA space mission in 2014. A specific mechanical design of the fiber-optic coupling was implemented to cope with the g-forces involved. The Lambert Instruments HiCAM is a hybrid intensified CMOS camera designed for high-speed imaging and/or ultra-fast gating at low light-levels. The HiCAM is equipped with the latest Gen II and Gen III image intensifiers providing the best possible resolution and sensitivity. Applications in the life sciences include calcium imaging, fluorescence imaging and widefield fluorescence correlation spectroscopy. Applications in the engineering sciences include combustion, particle image velocimetry and laser induced fluorescence. frequency domain imaging using lock-in detection. With its fast-gating module the TRiCAM offers gating down to 2 ns (FWHM) at 100 kHz. There are three models, the TRiCAM M for frequency domain FLIM, the TRiCAM G for time domain (gated) imaging and the TRiCAM GM for both frequency and time domain imaging. For a detailed specification of the features and applications of this versatile ICCD please visit the specific product pages for the TRiCAM M and the TRiCAM G.
Being very sensitive tools for ultra high speed imaging the HiCATT and HiCAM are often exposed to high energy radiation. Applications like combustion experiments or UV-spectroscopy in a synchrotron beamline are good examples for situations where the photocathode can be prone to harmful scattered or direct incident light. Although this is fine during the actual measurements, extended exposure to stray light or laser bundles during alignment and other activities may damage the photocathode. To avoid fiddling with lenscaps between measurements we have added a mechanical shutter to our intensified high speed product line. The shutter is encased in a aluminum housing with a standard F-mount input that replaces the original F-mount adapter of the HiCATT or HiCAM. The back focal distance of the F-mount input is unchanged so any F-mount objective can be used. The shutter comes with a power supply and a remote shutter controller with a timer. The timer can be used to automatically close shutter after a predetermined time. The remote has a stylish and ergonomic design and a large LCD screen. The shutter can also be controlled by a external TTL signal. When purchased together with one of our digital interfaces (s, d or p option) the shutter is controlled by the software of the digital interface.